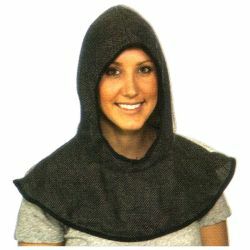 The chainmail medieval knight headpiece can be worn alone to create a quick and basic costume for any occasion or can be used as a part of a knight costume that is unique to you for your next Halloween, masquerade, or medieval themed party by pairing it up with any number of our medieval knight accessories. The chainmail medieval knight headpiece feature black fabric with a silver mesh to give the look of chain mail without the weight. Colored as pictured. One size fits all.